Boston Dynamics' robots can do more than just walk, jump and climb stairs. 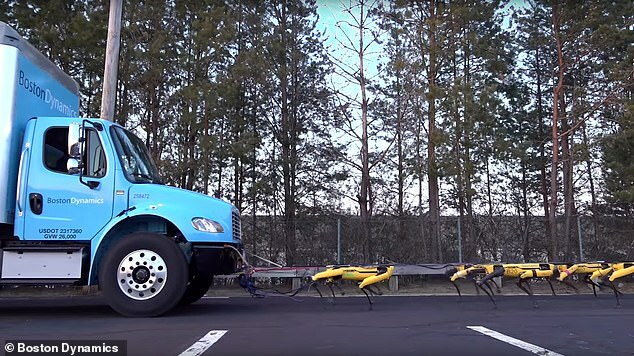 In a new video, the company demonstrated just how powerful its Spotpower robot dogs have gotten, as a pack of them are shown pulling a truck across a parking lot. All it takes is 10 of the advanced robots to drag a vehicle that's in neutral gear. Boston Dynamics noted that the robots were able to haul the truck at an approximately 1 degree angle uphill, though it doesn't say what the distance was or the duration of the haul. That said, it still signifies a remarkable feat for the robot dogs, which were first introduced in 2017 as a four-legged nimble robot. Boston Dynamics noted that its robot dogs are so advanced that they're now being rolled off the production line. 'These Spot robots are coming off the production line now and will be available for a range of applications soon,' Boston Dynamics said. The company didn't specify just how the Spotpower will be put to work, but previous suggestions have included deployment in warehouses, disaster relief situations or even security purposes. It's also unclear what the robots will be priced at or when they'll launch. It comes as Boston Dynamics has said it hopes to have the Spotpower available for purchase by sometime this year. A video shared by the firm last October showed the robot being put to use in the workplace. Spot is just under three feet tall and has 3D vision, as well as 17 joints to help it move nimbly. Boston Dynamics CEO Marc Raibert said earlier this year that he hopes Spot can be used in a variety of industries, including construction, delivery, security and home assistance. Raibert also denied skeptics' beliefs that his firm's robots would one day be used to kill - insisting that they're more likely to take on the role of servant in the future. 'We think about that, but that's also true for cars, airplanes, computers, lasers,' Raibert said.